THEATRE OF DEATH: LIVE AT HAMMERSMITH (2009) is a CD and DVD release of Alice Cooper’s headline performance at the HMV Hammersmith Apollo in London, England. 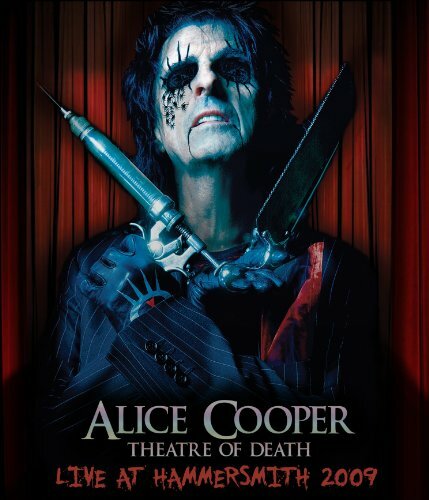 The Theatre Of Death Tour for 2009 was basically a continuation of the same tour Alice has been doing since 2008 in support of his last studio album, ALONG CAME A SPIDER (2008). The only difference between this tour and the previous one is that only one song from ALONG CAME A SPIDER (‘Vengeance Is Mine’) is featured, although the setlist contains most of the classics that Alice normally plays and a few deep tracks and newer songs from albums he’s released over the last 10 years. I saw the current North American tour (with Rob Zombie) back in October and the difference I can tell between the two is that the Hammersmith show has a few extra songs, but it’s primarily the same set, and the stage show/performance is the same. What you have here is a two disc package in a regular CD jewel case containing the DVD of the full concert and the accompanying audio CD. Basically, both are one in the same except that one is video and one is audio. It’s nice that the two are packaged together so you spend a reasonable amount of money and you get great value. What you’re buying this set for is the DVD, Alice Cooper has such a theatrical and visual show that the only way to appreciate it is to actually see it. How many other artists kill themselves multiple times on stage? There’s the guillotine, noose and an IV needle all set up to kill Alice but, like the tour slogan says: “They keep killing him…..and he keeps coming back!”. The full performance is truly great with the interaction between Alice and stage performer Tiffany Rowe who plays characters like Cold Ethyl and Nurse Rozetta, the different costumes and props and, as mentioned, the different killings of Alice all up against a great backdrop of music. As far as the setlist goes, you get the classics like ‘School’s Out’, ‘Billion Dollar Babies’, ‘Poison’, ‘I’m Eighteen’ and a whole bunch of others but Alice and the band really lean heavily on the WELCOME TO MY NIGHTMARE album from 1975 by playing seven out of the album’s eleven songs. I can’t complain about that because I have been an Alice Cooper fan for a long time and I like all the classic records. What adds to the show for me is the newer songs because Alice has really had a rebirth in the album department since 2000’s BRUTAL PLANET on through ALONG CAME SPIDER, all of them are really solid records. There’s ‘Wicked Young Man’ from BRUTAL PLANET, ‘Vengeance Is Mine’ from ALONG CAME A SPIDER and ‘Dirty Diamonds’ from DIRTY DIAMONDS (2005) and all three come off great in the live set and fit in well to the stage performance. A solid package overall to have the live show captured on DVD and to have the live album for your stereo, car or iPod. There aren’t any extras here, just the same show on both discs, even the booklet is a little sparse but it does fold out to reveal a tour poster. I would call this an excellent live document of where Alice Cooper and his band are in 2010 and if you haven’t seen Alice in concert it’s a great way to experience it. Like I mentioned, I’m a big Alice fan, and I’m still riding a high from seeing him in concert in October, so this CD/DVD package was a must purchase for me and I’ve really enjoyed it. Great music and a great stage performance makes for a great concert and that’s what Alice Cooper always does. NEON NIGHTS : LIVE IN EUROPE is a CD and DVD release of Heaven & Hell’s headline performance in Germany, at the Wacken Open Air Festival on July 30, 2009. This is the last professionally recorded performance from the band and of the late great Ronnie James Dio. 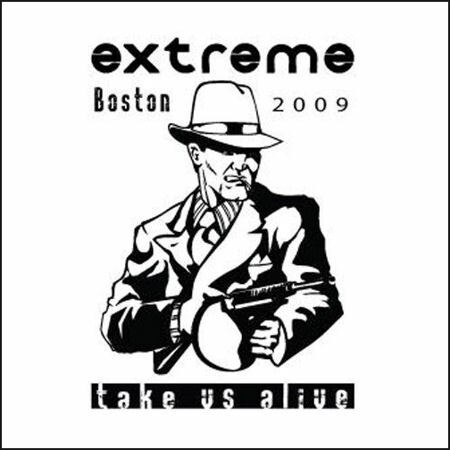 This wasn’t the band’s final performance because the tour, supporting their latest album THE DEVIL YOU KNOW (2009), continued throughout the world and I was lucky enough to see the show in Boston, MA a month later. That tour stop in Boston was a great concert and will always be one of my favorite shows because I was right up front and dead center, it turns out that it was also the next to last stop on the world tour and the next to last live performance Ronnie would ever have. Sadly, Ronnie James Dio passed away from stomach cancer almost a year later on May 16, 2010. So what we have here with NEON NIGHTS is two separate releases: a CD version and a DVD version. If you’re going to buy one, I’d pick the DVD because they are both around the same price but the DVD has a little extra. The DVD version of NEON NIGHTS captures Heaven & Hell’s headline concert of the first day of the Wacken Open Air Festival in the Summer of 2009. It’s the full setlist shot with mulitple cameras along with two interview segments as bonuses. As far as the setlist goes, this is the exact same set that I ended up seeing in Boston about a month later…..a bunch of classics and three new songs from THE DEVIL YOU KNOW. Even though Black Sabbath with Dio only released three studio albums, there are plenty of classic tracks to choose from including ‘Mob Rules’, ‘Die Young’, ‘Heaven & Hell’ and ‘Neon Knights’ but, the tracks I like the most are ‘I’ and ‘Time Machine’ from the highly underrated DEHUMANIZER (1992) album. The difference on the setlist on the DVD is that the ‘E5150’ intro is shown in it’s entirety at the beginning and an abbreviated version of ‘Country Girl’ is played and segues into ‘Neon Knights’ to close the show. It’s a great performance, a great concert with timeless music and flawless performances. All the members are top notch on their instruments and, for a man around 66 yrs old at the time and battling the early stages of stomach cancer, Ronnie gives another spectacular performance. The bonus features include 30th Anniversary interviews with each band member. VH-1 Classic’s Eddie trunk interviews Ronnie James Dio, Vinny Appice and Geezer Butler while Classic Rock Magazine’s Malcolm Dome interviews Tony Iommi, all the interviews focusing on the timeline of Black Sabbath/Heaven & Hell history over the last 30 years. There really isn’t anything new to these interviews if you’ve followed this version of the band over the years, the band history is pretty much recalled the same by all four member, what is interesting though is the will and desire to continue with the current lineup making new music and touring. These interviews were done before Ronnie’s death so, at the time, the plan was to continue with Heaven & Hell. Another round of interviews with Tony, Geezer and Vinny were added as a tribute to Ronnie after his passing and they are basic quick segments of each member remembering their friend and bandmate. The CD version of NEON NIGHTS has an almost identical performance compared to the DVD, the only differences being the omission of the ‘E5150’ intro at the beginning and the abbreviated ‘Country Girl’ that moves into ‘Neon Knights’. There’s not really much to say regarding the CD aside from that, the booklet, pictures and liner notes are exact to the DVD version and there are no bonuses. I really enjoyed NEON NIGHTS: LIVE IN EUROPE because it was a tour souveneir for me and a last look at Ronnie James Dio in action. My favorite Black Sabbath lineup has always been the Dio era and Heaven & Hell is a continuation of that era just with a slightly different name. Taking a good look at the entire package, I can’t help but wonder why Eagle Rock/Armoury Records didn’t just put the audio CD in with the DVD and charge one price for one package, it would be easier that way for fans. I hate to call it a “cash in” or a way to put extra product on the shelves after Ronnie’s passing because this was scheduled to come out anyway, and the concert performance is great, I just wish there were a few more extras remembering Ronnie. Overall, a good concert that was captured on audio and video and it will be the live document that will carry the Sabbath/Dio legacy forward. Well worth picking up on DVD, the CD is for diehards and completists. 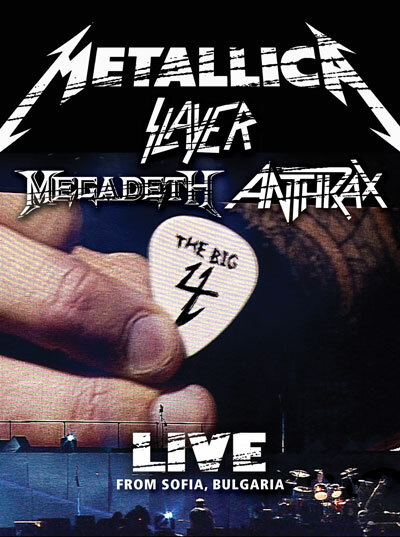 Filmed and recorded at the Sofia, Bulgaria stop on the Sonisphere Festival Tour (6/22/2010), this DVD/CD set captures an event that Metal fans around the world have been hoping for: the Big 4 of Thrash all sharing the same concert bill/tour. What was at least a year in the making from a negotiation standpoint, all four bands (Anthrax, Megadeth, Slayer, Metallica) all toured throughout parts of Europe together on the Sonisphere Festival tour, something that I can’t remember ever being done before. All I know is that I grew up with each band being a cornerstone of the Thrash movement back in the ’80s and it’s hard to deny the four bands’ history and legacy when it comes to Heavy Metal music. In addition to the Metal faithful in attendance in Sofia, the concert was screened in over 800 cinemas worldwide on the same day. This was a historical tour and I was sure that a DVD was going to be released and Lars Ulrich himself announced such plans to the audience at the show so I was eagerly awaiting this release. Once it was released, I paid the extra money for the complete audio & video deluxe set. I expected a nice box set and that’s exactly what I got. The box itself is a little larger than a regular DVD case and definitely deeper to fit all the materials. Inside is the DVD set and it’s the casing I don’t like much with one DVD sitting halfway over the top of the other, I always worry about scratches even though I am strictly careful. Also included are a full color booklet with plenty of photos and credits, a double-sided foldout poster with the box set artwork on one side and the tour poster on the other, four picture cards (one for each band) and a special guitar pick. After all that is removed, the five CD set is nestled inside! Each CD is housed in a cardboard slipcase with the band’s logo and a picture of parts of the drum kit, Metallica’s double disc is in a double-sided cardboard slipcase with logo and pictures of the crowd and the band in action. There are 2 DVDs and close to 6 hours of footage. DVD 1 includes complete sets by Anthrax, Megadeth and Slayer in that order and they were edited on site after each performance so the show could be viewed around the world in cinemas on the same day. DVD 2 is the full Metallica headline set and a bonus documentary of the backstage area and the rehearsal footage of the bands together on ‘Am I Evil?’. All the performances are recorded and filmed crystal clear (this isn’t bootleg material!) and each band gives their performances their all. I wasn’t surprised by the running order of bands like a lot of people were online: obviously Anthrax would open and Metallica would headline but where would Megadeth and Slayer slot in? I wasn’t surprised to see Megadeth second considering that the past bad blood between Dave Mustaine and his former Metallica bandmates might be too much to get Dave to open just before Metallica came on. The more I thought about it though, Slayer is just as huge internationally as Megadeth if not more in certain countries. Who knows? I thought the running order was great and I enjoyed each band’s set. DVD 2 has the full Metallica set, the big draw being the four band jam on the Diamond Head classic ‘Am I Evil?’, and the behind the scenes documentary. If I had to choose which DVD is better, I would pick the first one because I think Anthrax, Megadeth and Slayer are truer to the cause than Metallica. I know I will take a ton of criticism for that statement but I really haven’t been into Metallica since the Black album…..I have all the albums since and see the band live but I just prefer the older stuff, the stylistic changes to their overall sound, as well as, their commercial aspirations have soured me over the last 20 years. I have enjoyed albums and concerts by Anthrax, Megadeth and Slayer a lot more in the last 20 years and I have become more of a fan of those bands as time has gone by when compared with Metallica. Like I said before, each band puts on a great show and the ‘Am I Evil?’ jam was really cool even if only Dave Lombardo from Slayer performed. If I had to pick the best performance for me it would be a tie between Anthrax and Slayer, I just enjoyed those more. The documentary after the Metallica performance was cool, you got a look at backstage life with each band, rehearsal/soundcheck footage, meet & greets with fans, band interactions and look at the stage area. Like the regular performance, the rehearsals for ‘Am I Evil?’ were extremely cool to be captured on film. One thing I really want to point out during all the bands’ performances is the crowd. Starting with Anthrax and ending with Metallica, the people packed into the stadium were ravenous for Metal and the bands. Anthrax had a large crowd to open that would easily fill arenas and sheds in the U.S. and, as the day continued, the crowds got bigger and hungrier for each band. I always like seeing Metal DVDs filmed outside the U.S. because it goes to show that there is a deep rooted love for all types of Heavy Metal around the world. I think the best way to sum up the five audio CDs is that they are cool bonuses. The main reason you buy this set is to see the DVD of the entire concert, the CDs are a cool way to re-live that on your stereo or iPod. For me, I liked having the live sets on CD because I have listened to them in the car and on my iPod…..you can only sit in front of a TV for so long! This way you get four live albums for your collections and each one is an exact copy of the performances on DVD, nothing is missing. If you couldn’t be there, or you didn’t have a theater near you that was screening the show, then this is a really cool box set to pick up. I paid the extra money to have the complete box set with the audio and video but there is a DVD only set that is priced lower, I’m not sure if it has all the extras like the poster, pick and pictures. Everything is professionally done, all the performances look and sound great and the behind the scenes documentary is definitely a bonus highlight. If your a fan of all or just a few of these bands, i recommend picking this up and watching a piece of Heavy Metal history. What can you say about Judas Priest’s BRITISH STEEL that hasn’t already been said? It is truly a landmark Heavy Metal album that bridged the classic heavy Rock of the 1970s and moved it into the slick and powerful 1980s with it’s pure metallic sound and commercial accessibility to FM airwaves. Look at all the classic songs that still get played on Classic Rock and current Rock radio: ‘Metal Gods’, ‘Breaking The Law’, ‘Living After Midnight’, ‘United’. I’m lucky here in Rhode Island because the local Rock station (94 WHJY) has one of the longest running Heavy Metal programs on Saturday nights called “The Metal Zone” and I’ve heard plenty of deeper tracks from BRITISH STEEL played over the years like ‘Steeler’ and ‘Grinder’. 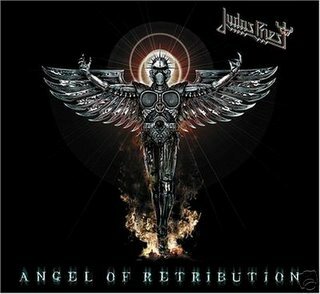 I grew up with this album, I think I got it in 1983 officially but I had a dubbed cassette, and it’s been one of my favorite albums by Judas Priest and of the ’80s. Now BRITISH STEEL is 30 years old…..that’s hard to believe! That’s most of my life (I’m 38)! In order to celebrate such a milestone, Judas Priest toured last summer and played the entire album in order, then added a handful of Priest classics and rarities. I caught the show in Mansfield, MA on July 7th and it was a magnificent show, now it’s great to have a commorative document to enjoy it again. There really isn’t much new to say about the remastered album because it’s exactly the same remastered version that the band and label released back in 2001. The two bonus tracks are also the same: ‘Red, White & Blue’ is a studio track from the TURBO sessions in 1985 and the live version of ‘Grinder’ comes from the Long Beach Arena (Long Beach, California) on the 1984 DEFENDERS OF THE FAITH tour. If you already have a copy of the proper album then you might not really notice the remastering, I didn’t in 2001, and the bonus tracks seem out of place. I have always wondered why we got bonus tracks from 1984/85 instead of rarities from 1980. I’m a little disappointed that the label used the 2001 remaster, I was hoping for something more. Here’s where the entire 30th Anniversary package gets interesting because the whole point of celebrating 30 years of BRITISH STEEL was the band’s tour. This live CD is the exact companion to the Disc 3 DVD except for the omission of ‘Prophecy’ from the NOSTRADAMUS (2008) album. I’m going to assume that the song was left off for time constraints on the CD format and, seeing that NOSTRADAMUS wasn’t the commercial and critical success the band hoped it would be, ‘Prophecy’ seems like the logical choice to cut. It’s a long song too and that is one of the reasons behind the 13 minute time difference between the CD and DVD. It’s all about getting bang for your buck and the audio CD of the show is a true bonus, the official U.S. release was a 2 disc set that included the remastered album and the DVD. The live album sounds good and it’s a solid performance by the band so I’m glad I held out and picked up the Deluxe Edition. I don’t hve 90 mins to sit around the TV and watch the DVD all the time so putting the live album in the iPod and enjoying a classic Priest tour is a major plus for me. Exactly the same as the CD version except that ‘Prophecy’ is included. I probably should have reviewed the DVD first but it’s technically listed as Disc 3 in the package so that’s how it will be for the review. Judas Priest toured on the basis of the 30th anniversary of British Steel in the Summer of 2009 and it was basically a basic show of the band just playing. Aside from the backdrop banners, the lights and lasers and the trademark Harley Davidson, there were no real production gimmicks. Basically the band came, on and played BRITISH STEEL note for note, took a quick break and came out with the second part of the set. The DVD is basically the same show I saw in Mansfield and it’s a cool piece of nostalgia for me because I had such a great time at the show. A few things of note from watching the DVD and remembering from the Mansfield show I saw: Halford was a little more animated on stage than he was on the previous two tours, he still has an awesome voice, Glenn & KK are a superb guitar duo, Ian needs to move around a little and Scott Travis is a monster drummer and it’s crazy to think he’s been in Priest 20 years now! All the guys looked like they were having a blast and they really poured everything into the performance. In addition to the concert there is a bonus section that is an interview about the making of BRITISH STEEL. It’s good to watch once but if you have the CLASSIC ALBUMS DVD for BRIISH STEEL then you don’t really need the interview. 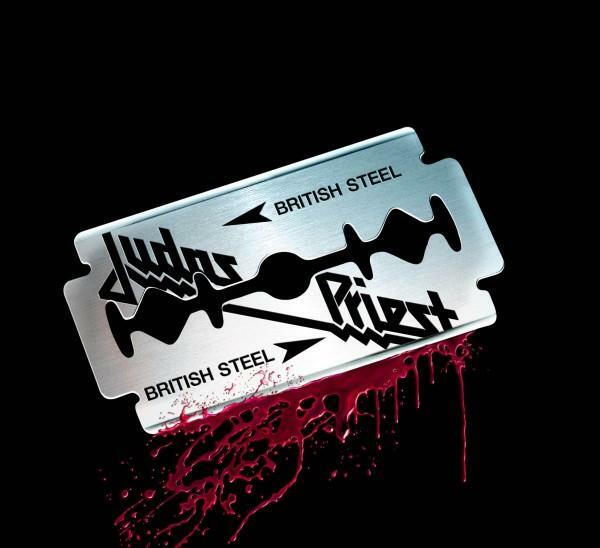 Diehards may not be happy with the 2010 version of the BRITISH STEEL album cover with the blood added and the hand missing but it doesn’t really bother me. 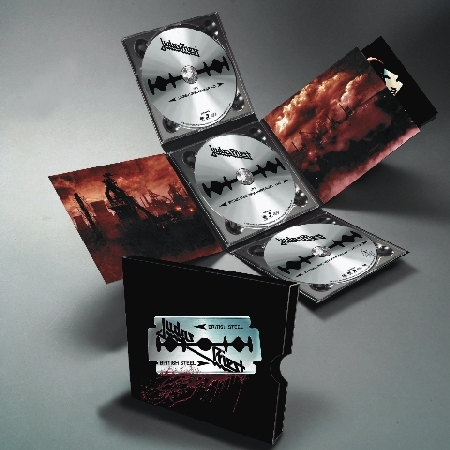 The digipak folds out revealing the discs, the factory pictures on the left & right panels were used as backdrops during the BRITISH STEEL part of the concert and the booklet is housed inside the right panel. The booklet has the original album cover, plenty of pictures from the concert, liner notes from the show & tour and a 2 page essay from British writer Dave Shack. Judas Priest is my second favorite band (KISS is first!) so buying this was a complete no-brainer. Add the fact that I saw the show in Mansifield, MA ten days prior to the recording and this turns out to be a cool tour souvenir for me. Diehards, collectors and completists are going to pick this package up but the casual fan might not because of the $30 price tag. The 2 disc version was retailing between $15-20 for the album and live DVD but I wanted that extra audio CD of the live show and the deluxe packaging. I like sets like this, for me it’s worth the money. If you don’t have BRITISH STEEL yet and you’ve never caught the band on tour then this is a cool package to have. My only minor complaints lies with the remastered album and the bonus section of the DVD. I understand the point of not remastering the proper album again but why not include some new bonus material? Also, if there is already a DVD out there on the making of BRITISH STEEL, why include a new interview on the same subject? Diehard fans like myself appreciate the effort but would rather have had more footage from the tour, backstage footage, etc. I was lucky enough to catch Iron Maiden’s Somewhere Back In Time world tour in Mansfield, MA last summer so I was really looking forward to this DVD documentary on the band’s first leg of the tour. FLIGHT 666 is named for the airline call numbers of Iron Maiden’s custom made Boeing 757 airplane (nicknamed Ed Force One) that the band, crew, families and gear flew in to travel over 50,000 miles across the globe to play 23 concerts in 45 days. Making the flights even more special was the fact that lead singer Bruce Dickinson, a pilot for Astraeus Airlines, was behind the controls…..talk about double duty! Disc 1 is the documentary that takes you behind the scenes from planning the tour to how the band travels and how they spend their time off. There are plenty of interview pieces with band members and crew but the most important part of the film is the focus on the fans and the hysteria that forms when Ed Force One touches down in different countries. Travelling with the band from England to Mumbai, India for the first gig you get hit with the reality that Maiden are a worldwide phenomenon and that Maiden fans are some of the most passionate in the world. Just watching the crowd from Mumbai swirl and sway to ‘Aces High’, and watching the pre-show fan hysterics, I am a bit jealous because I wish the crowds I am usually in here in the U.S. were just as passionate. You can definitely tell the difference between the faithful in India compared to the fans in the U.S. but the real story doesn’t come until the band travel to Mexico and South America. Iron Maiden has played all over the world and, as Bruce Dickinson put it, ‘The further south they go, the hotter it gets.” How true! Starting with the Mexican dates and moving into Costa Rica, Colombia, a string of dates in Brazil, Argentina and ending in Chile, you really see the height of Maiden fanaticism in the Latin American countries. From the crowds waiting at the airport and hotels to the crowds outside the arenas, you get a sense of just how important Heavy Metal is to these people and I could identify with them. Different fans that were interviewed made it clear that Maiden’s arrival for a show was an important event. You had fans talking about how the gig was “the thing” to see and that friends had quit jobs to be there, others in Colombia spoke about police oppression and how important the Maiden concert was to them. You could see the impact the concerts had with the crying fan in Costa Rica who caught a Nicko drumstick to the fans in Colombia who camped out a week in advance of the show with no food just so they could be close to the stage. It’s this fan interaction that makes the film and it’s exactly what filmmakers Sam Dunn & Scot McFayden have done with their previous films METAL: A HEADBANGER’S JOURNEY and GLOBAL METAL. Seeing the band offstage, mixed with the fan reaction, mixed with parts of the stage performance in each country is a cool way to tell the story. I like seeing other things bands do on tour besides give the same old interviews with the same old tour stories. Seeing Bruce Dickinson behind the controls of Ed Force One was cool and seeing the band travel with their families was something you don’t immeadiately think of when you think of a Metal tour. There were some Metal dignitaries backstage at the U.S. performances in L.A. and New Jersey, some of them gave interviews or spoke to the cameras (Tom Morello, Kerry King, Lars Ulrich and Vinny Appice) while others were just quick sightings (Ronnie James Dio, Scott Ian, and Doro)…..I always like seeing who’s backstage because I never get there! There are also scenes with band members doing different things on their days off like Adrian Smith playing tennis with the pros in Australia while Nicko McBrain & Dave Murray played golf. There’s the quick soccer match footage in Brazil where I think I might have seen the guys from Sepultura with Steve Harris in a quick shot and there’s also the band exploring the temples in Mexico. I would have liked a little more in depth interviews with some of the band members, specifically the quiet Dave Murray and elusive Janick Gers, but the star of the offstage footage was Mr. Nicko McBrain…..he made the DVD! Just something about the madman behind the drumkit in golfing attire with his hair slicked back just seems so funny! Disc 2 is the complete setlist live in concert with a song filmed in each of 16 different cities around the world. The setlist is exact to the one I saw in Mansfield on the second leg of the tour so there are some really good Maiden memories attached to the performance but, like Disc 1, the quality of the performances are linked to the crowd reaction of the different countries. You can definitely see the differences between the crowds and how some are more rabid and Metal hungry than others. Watch ‘Aces High’ from Mumbai, India or ‘Powerslave’ from San Jose, Costa Rica and compare it to ‘The Number Of The Beast’ in Los Angeles…..it’s like two completely different worlds. The L.A. crowd seems tame compared to the chaos of any South American, Indian, or Japanese audience! The running order of the live set doesn’t correspond to the travelling but to the setlist itself. Just like the band criss-crossing the globe, the DVD is a criss-cross of different performances in different countries in order to keep the original running order intact. The L.A. show is sandwiched between Mexican dates and the New Jersey performance seven songs ahead of where it was in the tour itinerary. For me, I would have rather had the original itinerary but the band went with the best performances of their songs and mixed the country order. Not a big deal I guess. The live set is just as solid as all the other live Maiden DVDs but it doesn’t have the same impact as the actual film. Iron Maiden is a legendary Heavy Metal band with an impact that truly is global. Everytime the band releases an album, a DVD or goes on tour, they give 110% and they never disappoint…..this is why they have been one of my favorite bands since I started listening to Metal when I was a kid. When you see an Iron Maiden show, you know you are getting a top notch performance…..and when they translate that live show into a DVD package, you know you are getting possibly the DVD of the year! Last year Maiden released the LIVE AFTER DEATH DVD and it took top honors as the best DVD of 2008, now they give us FLIGHT 666 and it will be hard to beat in 2009! For me, the band could have just released the film and it would still be the best DVD so far this year but they also made sure to give everyone the full Iron Maiden live experience with a 2nd DVD of the concert setlist. Overall, another successful world tour and another visual triumph. All the songs Iron Maiden played live on this tour were classics but the songs they filmed in India, Mexico and South America are the best because of the crowd reaction. If I had to pick one song that would be my favorite it would be a tie between ‘Powerslave’ (in Costa Rica) and ‘Fear Of The Dark’ (in Colombia). Anything that combines Metal music to a unique film concept is right up my alley so I’ve been anticipating watching this DVD for a few weeks. Once I got my copy in my DVD player I kicked back and watched one really good independent film! The film centers around two Viking explorers that have been abandoned by their expedition after a losing battle with the natives (Skrealings) of this newly discovered land (North America). The film tracks their survival and journey as they try to make their way North to rejoin their comrades. The Vikings hunt, build shelter, encounter Christian priests (complete with a church burning), and ultimately meet their demise. The plot doesn’t seem like much but it’s the realism that really hooks you in. Nothing is as real as watching the Vikings survive in the lush forest landscape from their hunting and fighting to actually taking a dump and wiping off with leaves! Honestly, I could have done without a Viking taking a dump but think about it…..isn’t that something that would need to be done? The fight scenes and the killing that is done in the film is brutal in it’s rawness but not gory like a B Horror flick. It’s all about bringing the viewer into the adventure with as much reality as possible. I don’t want to simplify everything here but that is essentially the plot, there really isn’t too much to it. The sub-plot is each Viking’s personal attitudes and their personal journey of self-awareness. What makes the film for me is the way it was shot. Obviously this isn’t a Hollywood action flick with millions behind it but I liked the way director Tony Stone used regular cameras as well as handhelds to give the proper perspective. When watching scenes from the handheld cameras you get the sense of urgency and the sense of actually being in the thick of the forest as the events unfold. I also like the fact that there was minimal dialogue and that the actors spoke in what seems to be a Norse language but the subtitles kind of kill the vibe. The film is all about authenticity and realism, I would have rathered heard the dialogue with no subtitles so I could interpret the communication my own way. There is a particular scene in the beginning where the Vikings are feasting on some game and one turns to the other and mentions how “killer” the food is. “Killer”! Seriously, couldn’t someone come up with something less Hot Topic! The Metal aspects of the film are obvious. First…..Vikings! If there was ever a subject that the Metal world understood it’s Vikings. Second…..Norse mythology vs. Christianity. If there’s another subject that the Metal world undertands it’s Norse mythology. Take a look at most of the Scandinavian Black Metal scene and there are plenty of examples and influences of how pro-Norse/anti-Christian attitudes permeate the music. Third…..the soundtrack. It’s a more subdued Metal soundtrack than I expected, more atmospheric and ambient but still containing the heaviness of Old Man’s Child, Dimmu Borgir, and Burzum among others. There is one scene that seems way out of place…..the headbanging scene in Chapter 2 – Camp. In Chapter 1 – Stranded, the Viking pair make a shelter to survive. At the beginning of Chapter 2, the shelter is built, the Metal music starts out and you see the Viking called Orn headbanging in celebration. Totally out of place! Why go through all the effort of being as authentic as possible and then put in a quick scene of a Viking rocking out? I really enjoyed SEVERED WAYS because of the way the film was presented, the more real it became the more I liked it. The actors did a great job and the way the film was shot added to the realism of being stuck in primitive North America in 1007 A.D. There really isn’t anything Metal about the film except for the underlying soundtrack but it is a cool connection with the Norse theme. If you’re looking for a fantasy based epic from Hollywood then this isn’t the movie for you. If you’re looking for some sort of Heavy Metal themed video, this isn’t the movie for that either. What you get is a basic journey of two stranded Vikings in a foreign land: they eat, they sleep, they crap, they kill, they die. It’s all very basic but the way it’s all presented is the key. Well worth checking out….. Celebrating their 35 anniversary, Germany’s most successful Heavy Metal band, Scorpions, invited former members Uli Jon Roth, Michael Schenker and Herman Rarebell to join them onstage at Wacken Open Air 2006. Billed as “A Night To Remember, A Journey Through Time”, the August 3rd performance’s setlist was voted on by fans around the world via the Scorpions’ website and witnessed by over 60,000 metalheads in attendance. This DVD is just the basic concert with a setlist that is very predictable featuring most of the well known singles from the ’80s & ’90s. You can’t fault the band for playing the songs the fans want to hear but most of them are the hits that you expect: ‘The Zoo’, ‘Tease Me Please Me’, ‘No One Like You’, ‘Still Loving You’, ‘Rock You Like A Hurricane’ and more. The real magic is when the guest musicians arrive onstage and join the band for some classics. I’m a fan of the Scorpions’ entire catalog even though I came of age with BLACKOUT (1982) so when Uli Jon Roth and his Sky Guitar joined the band for ’70s classics ‘Pictured Life’, Speedy’s Coming’ and ‘We’ll Burn The Sky’ it was truly a highpoint. I’m a fan of Uli Jon Roth’s solo work too and to watch his fingers fly over his custom Sky Guitar was really cool. The Scorpions have been incorporating some of the earlier material in their live sets the last few years and I heard ‘We’ll Burn The Sky’ live a few years ago when they toured the U.S. with Whitesnake in 2003. The other major highlight for me was when one of my all-time favorite guitarists, and original founding Scorpions member, Michael Schenker joined the band onstage for ‘Coast To Coast’, ‘Holiday’, ‘Lovedrive’ and ‘Another Piece Of Meat’. Michael wasn’t as animated as his older brother Rudolf but his playing is just so smooth and effortless (same for Uli Jon Roth!) that it’s a thrill for me to see him play. It’s always good to hear ‘Lovedrive’ and ‘Another Piece Of Meat’ live but to get them with Michael was a treat for me. Herman Rarebell also came out during James Kottak’s drum solo and then took over the kit for the hits ‘Blackout’ and ‘No One Like You’ but the ultimate reunion highlight is ‘In Trance’ everybody is onstage joined by Tyson Schenker (Michael’s son) on his own Flying V. It was also nice to see the fans voted a newer song into the Wacken setlist because ‘Love ’em Or Leave ’em’, from UNBREAKABLE (2004), is excellent live. I wouldn’t have minded a second song from UNBREAKABLE if they had added one more in, it was a really good record and a return to the band’s signature sound. Excellent DVD of the Scorpions’ Wacken performance, the music is played perfectly and the band has a ton of energy onstage. The setlist has a bunch of the usual standards but the guest musicians and the deeper ’70s tracks are high points of the show. It’s a reunion of course! The only thing missing is some extras and/or bonus footage but it’s a small complaint when you get a 2 hour & 20 minute concert by one of Metal’s top bands. 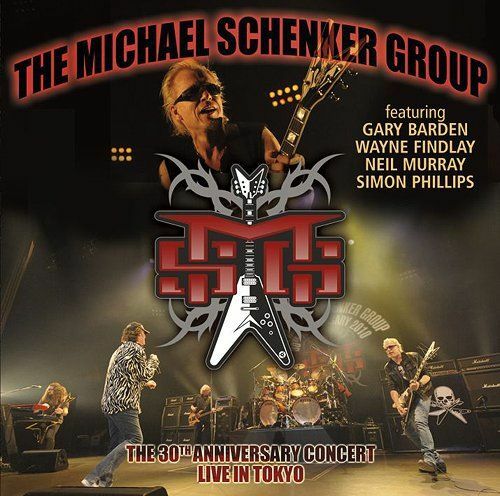 Definitely a DVD worth picking up…..
As I mentioned, the setlist is full of well known Scorpions tunes but the highlights for me were the songs that included Uli Jon Roth and Michael Schenker. Filmed live at the House Of Blues in Chicago, IL on 11/6/2006. Wouldn’t You Like To Know Me? My favorite band is KISS so when one of the members has a solo or side project it’s the next best thing. I was a big fan of Paul Stanley’s 2006 solo album LIVE TO WIN, especially since KISS hasn’t released any new studio recordings since 1998 but also because I have always believed that Paul is the musical heart and soul of the band. Call him the frontman, the Starchild, call him Gene’s partner but I have always maintained that without Paul Stanley as a creative driving force, KISS in the ’80s would not exist. On to the DVD…..
Out of the 18 song set, 12 tracks are songs that are basically newcomers to the live arena. When was the last time you heard KISS do a song from one of the ’78 solo albums? Or ‘A Million To One’? Or ‘Magic Touch’? These were the highlights among KISS standards Paul has to do (‘Love Gun’, ‘Detroit Rock City’, etc.) and they sound like they have been played live for years. It’s a basic performance full of music and energy. If you want to see a good concert DVD that is all about the music then you could do a lot worse than ONE LIVE KISS. Paul Stanley and his band sound great and the song selection has something for everyone from the KISS diehards to the casual fans to the fans of Paul’s solo work. There aren’t any bonuses, gimmicks or tricks, it’s all about the music. After watching this DVD I realized something that KISS fans the world over have known for years: Gene Simmons may be the guiding force on the business end but Paul Stanley is the talent on the creative end. Heavy Metal In Baghdad is the story of Iraqi Heavy Metal pioneers Acrassicauda. 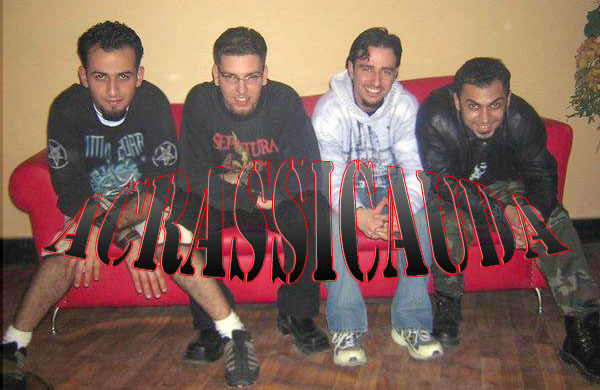 Directors Eddy Moretti and Suroosh Alvi turned their attention to Acrassicauda based on a magazine article that chronicled the Metal scene in Iraq as the regime of Saddam Hussein fell in 2003. The film follows the band from 2004 through 2007 as they try to find a way to survive and keep their Heavy Metal dreams alive in their war-torn homeland. The documentary shows a history of the band from their early beginnings in 2000-2001 up until early 2007, depicting not only their struggles as a Metal band but also as human beings. One of the most striking things about the film was the real look inside devastated Baghdad that Alvi & Moretti made sure they captured. Seeing the destruction, danger and despair from a different angle than what we are shown on the U.S. news brought everything down to earth. The band is more than a Metal band, they are just regular people and all they want is to have the freedom to live. Their is a bond among the members and their family that is pure and their only goal is to find a better life somewhere…..all the while missing the country, and family, they left behind. The film follows the band from Iraq to Syria then to Turkey as each new challenge to survival means relocating. Everyday brings new problems, new hassles, in an effort to make a better life. Shows you just how lucky we are here in the U.S.! There is music on this DVD too, it’s not all doom and gloom. Their is footage from various gigs over the years, as well as the band in the studio during their first recording session, makes you remember that this is about a band. These guys love Heavy Metal…..they like to play it, listen to it, and live it. The basic premise of the film is to show how Acrassicauda has survived with their lives turned inside-out by the war that has ravaged their country for the last few years. The band is more than a band, more than simply Iraqis…..they are people with hopes, dreams, and ambitions and a specific desire to have a better life. I have to give the directors credit for bonding with the band and their families and trying everything they can to help them. 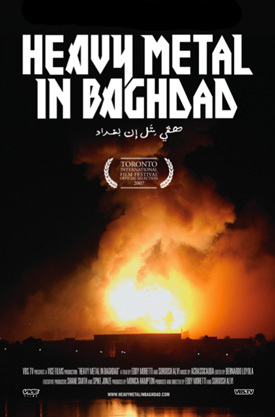 This DVD is a step in the right direction for the awareness of the plight of millions of innocent Iraqi people as told through a Heavy Metal band’s survival. Definitely a must see and one of the best Metal documentaries I’ve seen. It’s a bit more political and focused on the effects of the war than on actual music but it is a fascinating and riveting story. If you go to the Heavy Metal In Baghdad website, there is a link for donations that go directly to the effort to help the band continue their daily survival and quest for a stable life.